Volunteers will gather at Woodcraft retail stores on Veterans Day weekend to turn unique wood pens for men and women in the military service. 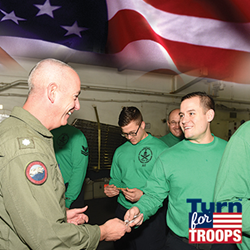 Commander Ed Fosatti – HSM 70 passes out handmade wood pens from the 2016 Woodcraft Turn for Troops Turn-a-Thon to the crew on the USS George H. W. Bush aircraft carrier. If you have never participated in our Turn for Troops program, we encourage you to join us this year at a Woodcraft store near you. Join Woodcraft in saying thank you to military personnel on active duty and recovering in rehabilitation centers by turning a wood pen during the 14th Turn for Troops National Turn-a-Thon on Veterans Day weekend, Nov. 10-11. During the past 13 turn-a-thons, volunteer turners of all ages have crafted 146,118 one-of-a-kind wood pens – 13,720 of them in 2016. Woodcraft provides tools and supplies for volunteer turners, who are encouraged to include a personal thank-you note with each pen. These personal messages may also include details such as the wood used to make the pen. To participate in this national event, contact the Woodcraft store nearest you for more details. If you have never turned a pen but would like to participate in the turn-a-thon, check with your local Woodcraft store about whether first-time pen turning instructions will be provided the day of the turn-a-thon. You can also check out two “Woodworking Adventures” blogs that include instructions for how to turn pens: Pen Turning 101 and A Great Start for Basic Pen Turning. Thirty-five percent of the 13,720 pens turned in 2016 – 4,840 – were sent to the USS George H. W. Bush aircraft carrier where they were passed out to the crew at the beginning of a seven-month deployment. For more information about Woodcraft, please contact the Woodcraft store nearest you, visit Woodcraft or call (800) 535-4482. Click here to learn more about Woodcraft franchise opportunities or email woodcraftfranchise(at)woodcraft(dot)com.